Universal Tool Low Vibration Orbital Sanders are lubrication free sanders that incorporate the latest engineering concepts, advanced materials and patented designs. Universal Tool Low Vibration Orbital Sanders feature technology that reduces weight, noise and vibration, while extending the tool life and the smooth design throttle lever and the ergonomic grip featured in orbital sanders provide unmatched operating comfort. Universal Tool Low Vibration Orbital Sanders are designed with either 3/32'' or 3/16'' orbit options, and non-vacuum, central vacuum, or self vacuum options. Universal Tool Low Vibration Orbital Sanders are also designed with a patented double sealed, lubrication free motor that prevents dust contamination of the air motor and eliminates the need for oiling. Universal Tool Low Vibration Orbital Sanders also feature a patented anti vibration motor that reduces vibration level to 0.8m/sec2. The UT8789-5-336CV Universal Tool 3/16'' Low Vibration Orbital Sander is one of thousands of quality tooling products available from MRO Tools. Please browse Universal Tool Orbital Sanders for tools similar to the UT8789-5-336CV Universal Tool 3/16'' Low Vibration Orbital Sander. 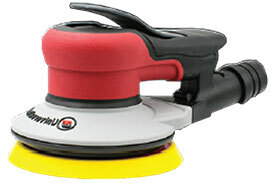 UT8789-5-336CV Universal Tool 3/16'' Low Vibration Orbital Sander description summary: Universal Tool 3/16'' Low Vibration Orbital Sander. Options: 5'' Central Vacuum Pad Size: 5'' Orbit: 3/16'' Pad Type: PSA No. Vacuum Pad Holes: 6 Free Speed (RPM): 11000 Weight: 2.0lbs Length: 8.4'' Width: 5.0'' Height: 4.3'' Noise Level (dba): 75 Quantity discounts may be available for the UT8789-5-336CV Universal Tool 3/16'' Low Vibration Orbital Sander. Please contact MRO Tools for details.